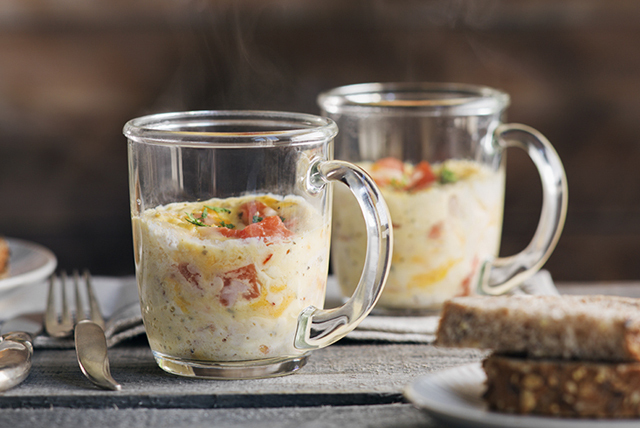 This simple microwaved egg recipe is sure to become a new morning favourite. The zesty lime dressing adds the perfect touch of flavour to the cheesy scrambled eggs. It couldn't be any easier! Whisk egg and dressing in small bowl until blended. Stir in tomatoes and cheese. Pour into microwaveable mug sprayed with cooking spray. Microwave on HIGH 1-1/2 min. or just until centre is set. Sprinkle with cilantro. Serve with toast. Serve spooned over toasted bread slice on plate. Substitute 2 egg whites for the whole egg. Mug will be hot. Wrap kitchen towel around mug before removing cooked omelette from microwave to serve.